Colombia is downplaying Monday's incident in which US national security advisor John Bolton perhaps inadvertently flashed the contents a yellow notepad he was holding during a White House press briefing to reveal handwritten text “5,000 troops to Colombia,” which was picked up by photographers. The words were seen scribbled behind “Afghanistan – welcome the talks” in apparent notes made while previously discussing White House foreign policy and national security. Colombian Foreign Minister Carlos Holmes dismissed the possibility of any impending joint action with its close ally the US, saying in a brief address late Monday that he does not know the "importance and reason" for Bolton's note. Holmes further said noting that his country will only act “politically and diplomatically” to restore order in neighboring Venezuela and will attempt to ensure new elections are held. Bogota has recently joined the United States in backing National Assembly opposition leader Juan Guaido as the legitimate "Interim President" of Venezuela and is seen in close coordination with Washington. The South American country shares a 1,370 mile border land border with Venezuela and has long been accused by the Nicolas Maduro government of harboring militants engaged in coup and assassination plots against him. Any significant US military intervention in South America would likely have Colombia involved at the very least as an important logistical and staging hub. Concerning Bolton's "leaked" notepad contents, there remains the possibility that having clearly written words on a mostly blank pad indicating that disengagement from Afghanistan equals ramping up engagement and intervention in South America is actually intentional signalling to both enemies and allies alike. It could have been a ploy to let Maduro know the White House means business and he better step aside and announce new elections "within eight days" according to prior EU demands. When asked following the briefing by eagle-eyed reporters who caught a glimpse of the notepad's contents about the "5,000 troops to Colombia" memo, the White House spokesperson responded, "As the President has said, all options are on the table." During Monday's comments, Bolton confirmed that President Trump is "leaving open the possibility of a U.S. military intervention to protect opposition leader Juan Guaidó, members of the nation's assembly and American diplomatic personnel," according to NBC. 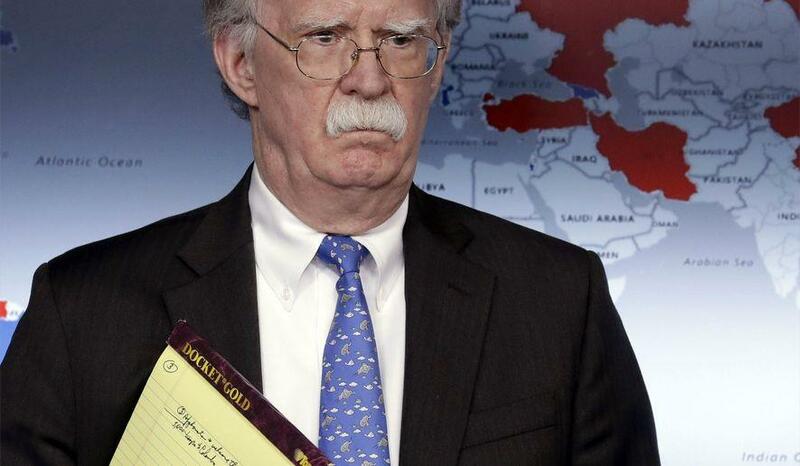 "The president has made it clear that all options are on the table," Bolton told reporters while holding the yellow notepad. "We also today call on the Venezuelan military and security forces to accept the peaceful, democratic and constitutional transfer of power," Bolton said. But should the White House actually order thousands of troops to the region amidst the ongoing crisis, especially to Caracas' nemesis Colombia, it would constitute an alarming escalation which would result in anything but "a peaceful transition".